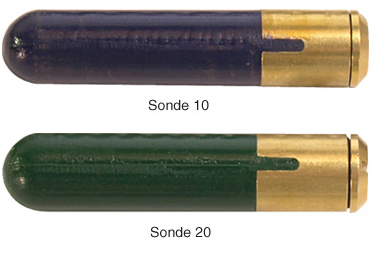 Gen-Eye Sondes are a great tool for pipe location in cast iron, clay, or plastic lines. 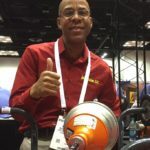 Sondes are a far less expensive way of locating lines than video pipe inspection systems, and easier than pipe transmitters. 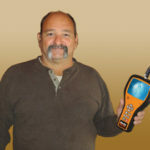 Easier than locating an energized line, you simply locate the pinpoint frequency of the sonde. The compact sonde transmits at 512 Hz and is powered by a AAA battery. Locate the Sonde 10 at depths of up to 10 ft. in case iron pipe, or 15 ft. in clay or plastic; or locate the Sonde 20 at depths of up to 20 ft. in cast iron pipe, or 30 ft. in clay or plastic. Attach the sonde to your drain cleaning cable using the spring carrier. Adapters for other brands of drain cleaning machines are available. The carrier protects the sonde as it travels down the line. Or you can tape the sonde onto a water jet hose, push-rods, flat rods, or other devices. Then use the Hot Spot pipe locator to easily track the signal from the sonde. 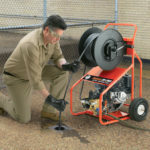 The Hot Spot pipe locator makes locating easier than ever. Its total field antenna and on-screen icons lead you right to your target, without the long learning curve. Spring carrier for Sondes with General coupling. Adapters for other brand available. Up to 10 ft. though cast iron or 15 ft. though clay or plastic lines. Up to 20 ft. though cast iron or 30 ft. though clay or plastic lines. 14° F to 122° F (-10° C to 50° C) Temperature affects battery life and locating range.